I have a friend who, every so often, brings back delicious French macarons from one of her favorite bakeries in San Francisco. Turns out her least favorite flavors are some of my personal favorites (hazelnut and chocolate orange, to be exact), which means I usually end up with plenty of macarons of my own. They are perfectly chewy with just the right amount of sweetness, and eating a whole box is a relatively easy task. 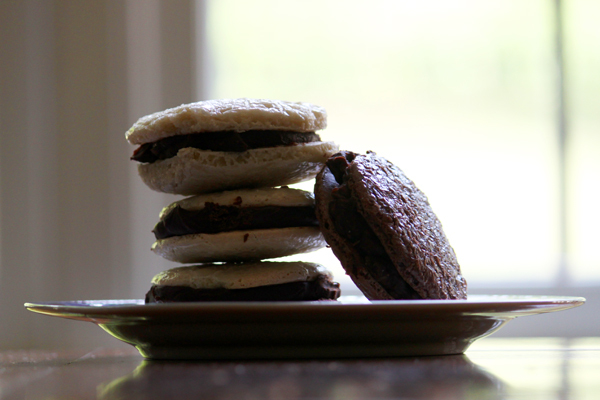 Recently, I had a craving for macarons — not the bland American version with overbaked shredded coconut (called macaroons), but the French kind, with filling sandwiched between two chewy, melt-in-your-mouth cookies. I scoured the internet for recipes, but finally settled on one from an article in the April/May 2011 issue of Fine Cooking, from pastry chef Joanne Chang. I think the original recipe, found here (along with a how-to video), is supposed to yield many cookies, with a much crisper texture than I ended up with. This was probably the result of the substitutions I made in the recipe (I used flour instead of almond flour, which definitely made the cookies much more cookie-like and doughy and less like meringues). However, they did end up chewier, which just made them more to my liking. I made three types of macaron cookies: vanilla (I didn’t have vanilla bean, so I added extract to the basic recipe), cocoa, and lavender (I added crushed dried lavender blossoms and a syrup made from steeping the blossoms in a small amount of hot water and saturating it with sugar). I paired the vanilla with a chocolate-orange ganache filling (I just used orange extract and it was delicious), the lavender with basic chocolate ganache, and the cocoa with hazelnut-chocolate ganache (bad idea on my part, because the crushed roasted hazelnuts in the filling tasted terrible after a day or two). 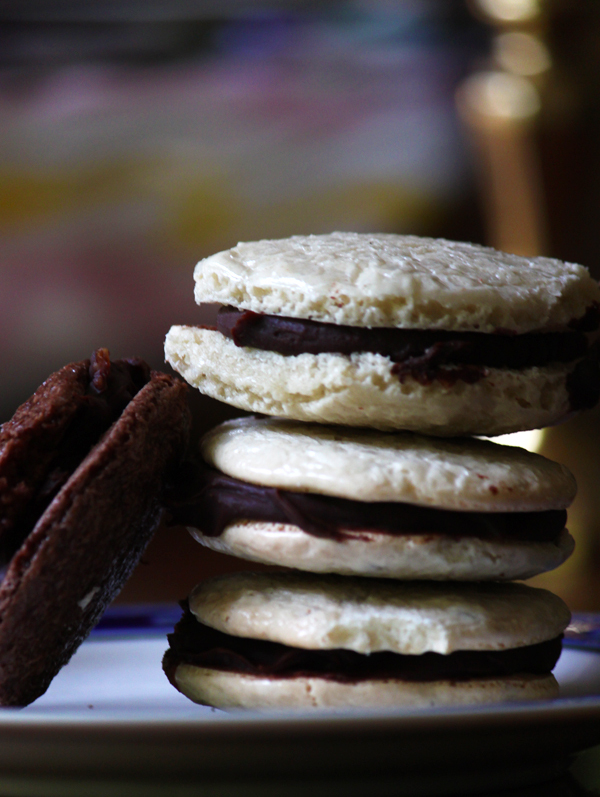 The Fine Cooking recipe also gives instructions on other cookie variations (such as almond, sesame, cinnamon, and black pepper), as well as more filling options (lemon curd, rosemary-lemon curd, vanilla buttercream, and espresso buttercream), but it’s pretty easy to experiment and come up with your own flavor twists. 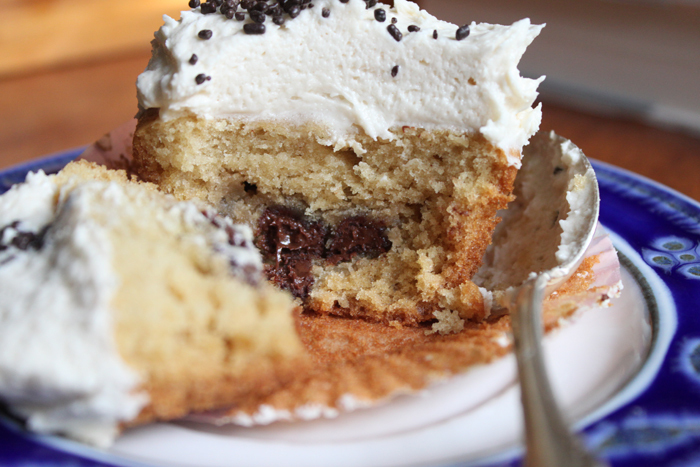 Chocolate chip cookie dough cupcakes. Try saying that five times fast. 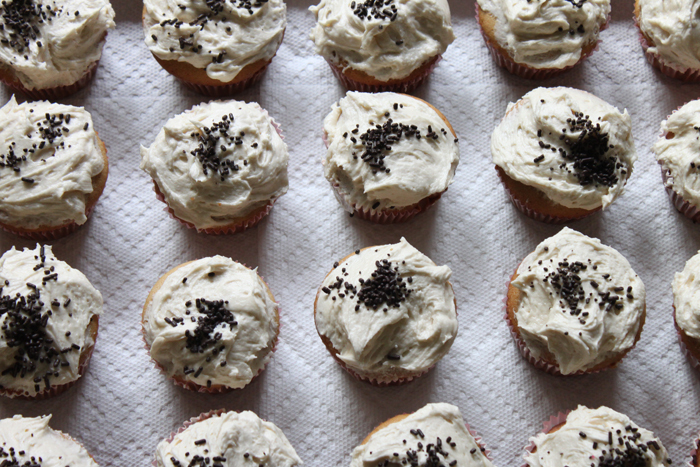 But seriously, bad jokes aside — these cupcakes are too die for. For some reason, my friends and I all have an incurable obsession with cookie dough. It’s delicious and honestly who wants chocolate chip cookies? The batter is ten times better! (Try saying that five times fast too!) But I digress. 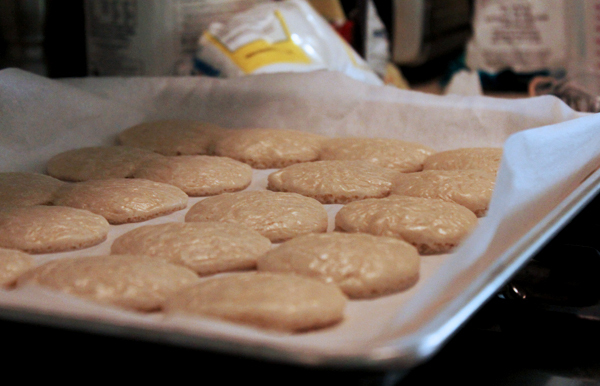 When my friend first proposed the idea of making these, I scoured the blogosphere for a good recipe to try out. Many called for baking the cupcakes first and cutting a hole in the baked cupcake to insert the cookie dough, but I wanted to find a recipe where the dough was actually baked inside the cupcake. I finally came across this recipe on Lovin’ From the Oven. (Well, it’s actually three separate recipes she compiled from various sites. This girl’s a genius!) They are not nearly as beautifully decorated as hers, as I am not skilled (at all!) with piping frosting. I can assure you they tasted heavenly though! 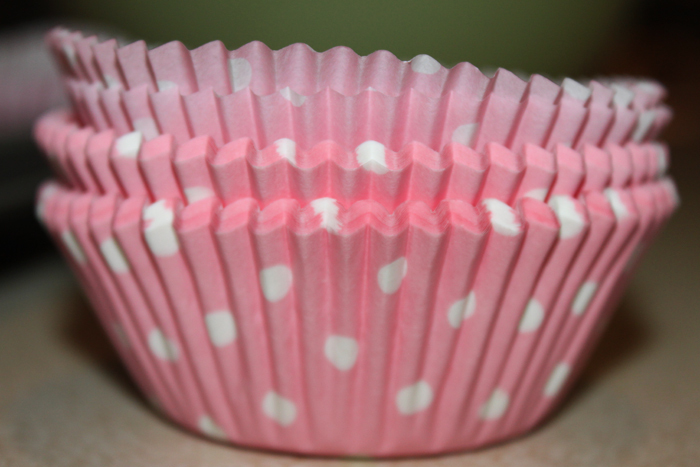 I used these adorable cupcake holders, which you can’t really make out on the finished cupcake. If you doubled the holders, though, I’m sure you would be able to see the pattern clearly. You can see the cookie dough center here (although it blends in with the cake somewhat). I would recommend using mini chocolate chips if you can, as the larger chips can be a bit much. 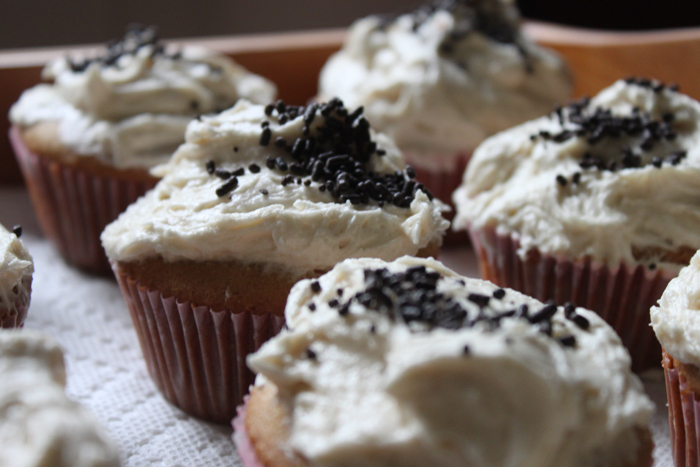 Also, the frosting is divine. 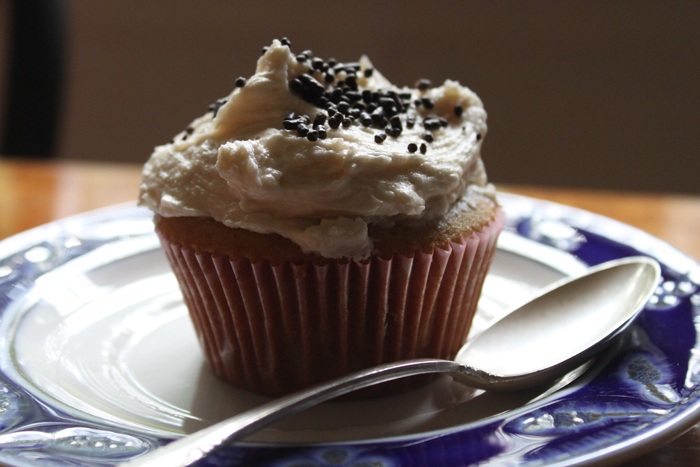 A little sweet, but it balances the cupcake quite nicely and is fluffy and has the perfect subtle hint of cookie dough. Don’t skimp on this stuff! The recipe I used was for 12 cupcakes, so I doubled all the ingredients to make 24. You will want to make the eggless cookie dough (for the filling and in the frosting) the night before. With the doubled recipe, I set aside about 3/4 cup — 1 cup dough (if you want a stronger cookie dough flavor use more) for the frosting and put that in the fridge. I then added the chocolate chips to the batter and rolled out 24 balls of dough and put those in the freezer overnight. You have to make sure they’re frozen before you make these, otherwise they’ll bake in the oven if they’re not cold enough! 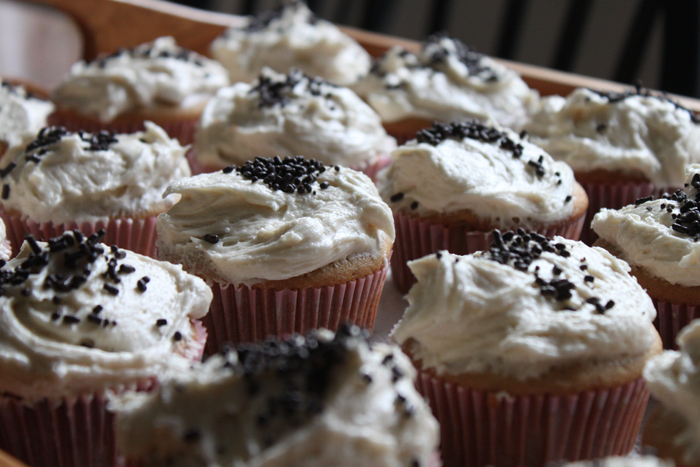 Another thing I found was that I had a lot of extra cupcake batter (because the dough balls in the cupcakes displace some of the batter) and plenty of frosting (perhaps from doubling the recipe?) so if you want to make more cupcakes, make a little extra cookie dough and you’ll probably get 5-10 more, depending on how much batter you put in the cupcake holders. These cupcakes require a little extra work than your run-of-the-mill chocolate and vanilla treats, but they are well worth the effort!